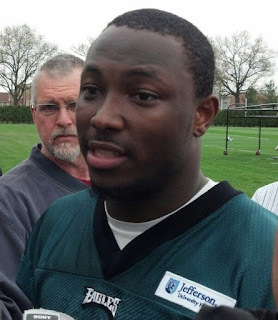 LeSean McCoy hosting celebrity event. Michael Vick, DeSean Jackson, Jeremy Maclin, Brent Celek and Fletcher Cox committed to appearing for Eagles teammate LeSean McCoy's celebrity softball event at Clipper Magazine Stadium in Lancaster this Saturday. Click here for information about tickets to the June 22nd game. The competition for the Eagles includes running back Ray Rice and wide receiver Torrey Smith of the defending Super Bowl champion Baltimore Ravens. Also, Plaxico Burress of the Pittsburgh Steelers, Harrisburg native Marques Colston and Mark Ingram of the New Orleans Saints, Mike Wallace of the Miami Dolphins and Devon Still, the Penn State product now with the Cincinnati Bengals. McCoy's brand partner, BODYARMOR SuperDrink™, is one of the sponsors. A “Home Run Derby” starting at 6 p.m. is scheduled to precede the 7 p.m. game. More fireworks are slated for after the softball game. Proceeds are scheduled to be directed to the LeSean McCoy Foundation to raise funds and awareness for ALS. McCoy’s late grandmother, Maryann Branch, had ALS.